The Michigan Retirement Research Center Working Papers has released three new working papers. Family composition has changed dramatically over the past 25 years. Divorce rates increased and remarriage rates declined. While considerable research established a link between marriage and earnings, far less is empirically understood about the effect of marriage on wealth although wealth is an important measure for older individuals because it represents resources available for consumption in retirement. In this paper we employ eight waves of panel data from the Health and Retirement Study to study the relationship between wealth changes and marital status among individuals over age 50. This research advances understanding of the relationship by first, incorporating measures of current and lifetime earnings, mortality risk and other characteristics that vary by marital status into models of wealth change; second, measuring the magnitude of wealth loss and gain associated with divorce, widowing and remarriage and third, estimating wealth change before and after marital status change so the change in wealth change is not the result of individuals entering or leaving the household and other sources of unobserved differences are removed from estimates of the effect of marriage on wealth. Our results suggest no differences in wealth change over time among individuals that remain married, divorced, widowed, never married and partnered over 7 years. In the short-run there are substantial wealth changes associated with marital status changes. Divorce at older ages is costly, remarriage is wealth enhancing and people appear to change their savings in response to changes in marital status. * Married people over age 50 save more out of their lifetime earnings than remarried, divorced, widowed or partnered individuals. * Changes in wealth at older ages is similar for married couples and single men who do not change marital status, but divorced and widowed women save less. * Individuals who divorce experience a loss of wealth two to four years before the divorce and during the divorce, and wealth recovery from increased savings after divorce. * Divorced individuals that remarry accumulate wealth at higher rates than those who remain divorced. Common financial planning advice calls for households to ensure that retirement income exceeds 70 percent of average pre-retirement income. We use an augmented life-cycle model of household behavior to examine optimal replacement rates for a representative set of retired American households. We relate optimal replacement rates to observable household characteristics and in doing so, make progress in developing a set of theory-based, but readily understandable financial guidelines. Our work should be a useful building block for efforts to assess the adequacy of retirement wealth preparation and efforts to promote financial literacy and well-being. * Common financial planning advice calls for households to ensure that retirement income fall between 70 and 85 percent of pre-retirement income in order to maintain pre-retirement living standards. * However, the common rules of thumb do not consider important factors that impact lifetime earnings and consumption, such as marital status, level of education, race, and number of children. * We find that 48 percent of married couples have an optimal replacement rate of less than 65 percent of pre-retirement income. The ability of family members to engage in intergenerational transfers of hands-on care requires close proximity or coresidence. In this paper we describe and analyze the patterns of proximity and coresidence involving adult children and their mothers using data from the National Survey of Families and Households (NSFH) and the U.S. Census. Although intergenerational coresidence has been declining in the United States, most Americans live within 25 miles of their mothers. In both the raw data and in regression analyses, the most robust predictor of proximity of adult children to their mothers is education. Individuals are less likely to live near their mothers if they have a college degree. Virtually all previous studies have considered coresidence alone, or else treat coresidence as a limiting case of close proximity. We show that this treatment is misleading. We find substantial differences in the correlates of proximity by gender and marital status, indicating the need to model these categories separately. Other demographic variables such as age, race and ethnicity also affect the probability of coresidence and close proximity, but characteristics indicating a current need for transfers (e.g., disability) are not correlated with close proximity. * While intergenerational coresidence has been declining in the United States, most Americans live within 25 miles of their mothers. * Individuals are less likely to live near their mothers if they have a college degree. * Adult children are more likely to live with their mother when the mother is older, in poor health, and unmarried. * Compared to whites, black Americans are more likely to live near and to live with their mothers, while Hispanic Americans are no more likely to live close to their mothers, but are twice as likely to live with their mothers. I argued in this piece for AEI's The American online magazine that the health reform bill proposed by Sen. Max Baucus would reduce the 10-year budget deficit only through an accounting trick by which increased Social Security taxes – which should, you know, be saved for Social Security – would be counted against the cost of the plan's increased health coverage. But it seems that no entitlement is left un-raided: the legislation put forward by Senate Majority Leader Reid, which contains the raid on the Social Security trust fund, would also impose some accounting tomfoolery on Medicare. It's well-known by now that Reid's plan would increase the Medicare payroll tax to help offset the costs of the plan. What I didn't know, though, is that these new taxes would first be laundered through the Medicare trust fund, creating an entirely fictitious improvement in Medicare's financial health. The new taxes are credited to the Medicare trust fund, created an entitlement to new revenues from the rest of the budget. But the actual revenues will immediately be used to cover non-Medicare health costs. Looks like double-counting to me. The folks over at e21 explain. In an era of increased life expectancies and underfunded pensions, longer work lives may be the best way to increase retirement income security. But what incentives does Social Security present to Americans thinking of working longer? What could reform do to encourage longer work lives? At this AEI conference, AEI resident scholar Andrew G. Biggs will discuss research on Social Security's incentives to delay retirement, while Estelle James, a pension consultant and former World Bank economist, will present findings on how Chile's 1980 pension reform affected labor force participation by seniors. Jagadeesh Gokhale of the Cato Institute will comment. What Drives Health Care Spending? Can We Know Whether Population Aging Is A 'Red Herring'? I have a guest-post over at Baseline Scenario blog. Abstract: In the U.S. and in Chile, there have been heated debates about the relative merits of a decentralized privatized pension system relative to a more traditional social security system. On the firm side, there are concerns that pension funds engage in anticompetitive behavior and take advantage of consumers' by charging high fees and account maintenance changes. On the consumer side, there are concerns that consumers do not select wisely among funds and take on too much risk. Any pension system with insurance features to protect against low levels of pension accumulations is potentially subject to moral hazard problems, in the form of consumers' taking on too much risk. In the case of Chile, the government provides a minimum pension benefit to those with low pension accumulations, which can make some consumers more willing to take risks. For these reasons, the Chilean government introduced regulations on pension fund firms' investments designed to limit risk. This paper analyzes the determinants of consumers' choices of pension fund and of pension fund characteristics (performance and fees), taking into account governmental regulations. In particular, it estimates a demand and supply model of the pension fund investment market using a longitudinal household dataset gathered in 2002 and 2004 in Chile, administrative data on fund choices, and longitudinal data on cost determinants of pension funds. We find that the existing regulation actually increases the level of risk in the market, reduces heterogeneity across firms, and reduces incentives for consumers to participate in the pension fund program. We suggest alternative more effective forms of regulation. * Low participation in the Chilean pension system, which is mandatory only for full-time workers in the formal sector, is due in part to the large informal sector of the economy. * Regulation requiring that pension fund administrators deliver a return within 2% of the industry average encourages more risk taking than if portfolio risk were regulated. * Fewer people also participate in the pension plan because of the risk taking by pension firms. * Older and younger individuals are more averse to risk. * The market is efficiently served by more than one firm. Abstract: We build upon the growing literature on financial literacy, which studies the prevalence of lack of knowledge about various financial issues, and analyze how much people know about the Social Security rules using a small pilot survey conducted in 2007, and a follow-up and extended survey funded by MRRC conducted in December of 2008. We then assess the consequences of the apparent prevalence of lack of information by individuals about the rules governing the Social Security system using a realistic and empirically-based life-cycle model of retirement behavior under uncertainty. We investigate the individual's retirement and savings decisions under incomplete information and unawareness, in which a portion of the population does not know some or all of the rules of the system. We compare the outcomes in these cases to the outcome under full information, computing the welfare gain resulting from the acquisition of information regarding the Social Security system. Our analysis can illuminate the need for policies that foster knowledge of the system, which can improve welfare, and can result in better policy outcomes. * Lack of basic knowledge about rules for obtaining Social Security benefits is widespread. * Younger people are less informed than older people, however, only 70% of individuals aged 55 to 64 are aware of the minimum retirement age. * Individuals who are reinterviewed show a large increase in knowledge about Social Security. * The benefits of being fully informed about Social Security vary by age. * Awareness could be increased by targeting messages pertinent to individuals based on their age or income level. Abstract: The generosity of public pensions may depress private savings and provide incentives to retire early. While there is plenty of evidence supporting the latter effect, there remains considerable controversy as whether or not public pensions crowd out private savings. This paper uses international micro-datasets collected over recent years to investigate whether public pensions displace private savings. The identification strategy relies on differences in the progressivity or non-linearity of pension formulas across countries. We also make use of large heterogeneity in earnings across education group and country. The evidence we present is consistent with previous studies using cross-sectional and time-series variation in savings and pensions. We estimate that an extra dollar of pension wealth depresses accumulated financial assets at the time of retirement by 23 to 44 cents and that an extra ten thousand dollars in pension wealth reduces the average retirement age by roughly 1 month. * The generosity of public pension systems affects both private saving rates and the timing of retirement. * Our study of 12 countries shows that generous public pensions depress lifetime asset accumulation. * For every dollar of pension wealth, financial assets are reduced by 23 to 44 cents. * Higher public pension levels also induce earlier retirement. * Retirement comes one month earlier for every $10,000 of pension wealth. Do seniors deserve that extra $250? Are they being treated worse by Social Security than other participants? The answer to that is no: receiving a zero COLA when inflation has been negative is much better than receiving a positive COLA that merely keeps up with inflation. Are seniors suffering more due to the recession than other Americans? Again, I'd say the answer is no: they're not affected by higher unemployment, most low-income seniors have relatively few assets to be affected by financial markets, and their biggest source of income – Social Security – is continuing to pay benefits. Will the payment to seniors stimulate the economy better than other uses of the money? Probably not – I'd rather focus on job creation – but that's an open question. Over at AEI's Enterprise Blog, I commented on a Washington Post article by MIT professor Simon Johnson and Yale law student James Kwak arguing that Social Security and 401(k) plans won't provide for a decent income in retirement. While they have a good qualitative case – after all, Social Security is facing insolvency and 401(k) plans face problems regarding participation rates and investment choices – their estimates of Social Security benefits just seemed too low. As it turned out, the problem was that they relied on one of SSA's online benefit calculators. As I pointed out last year regarding the Social Security Statement, while the calculator claims to show benefits "in today's dollars" it actually doesn't. It shows benefits in "wage indexed" dollars, which can make for a big difference. Johnson and Kwak were quick to acknowledge the error, which after all wasn't their fault, and discussed the issue further on their Baseline Scenario blog. But it's the source of the error that I'm interested in. Johnson and Kwak estimate benefits for individuals retiring in 2051. Let's say that the nominal benefit – meaning, the dollar amount that's actually paid each month – was $4000. To inflation adjust that back to today, we multiply $4,000 by the ratio of today's CPI to the projected 2051 CPI: based on this table from the 2009 Trustees Report those numbers are 100/315.37, meaning that the inflation adjusted value of $4,000 is $1,268. Now let's look at the wage-indexed value, which is what the Social Security Statement will give you and what you get when you choose "in today's dollars' from the online calculator. To get that, you multiply $4,000 by the ratio of today's average wage to the average nominal wage in 2051, which from the same table is $42,042/$209,615, which gives you only $802. Now, one big problem is that the calculator doesn't even tell you you're getting wage-indexed dollars. So when your scheduled benefit is actually worth $1,268 in today's dollars you'll think you're only getting $802. The fact that an MIT professor and a Yale law student couldn't figure this out seems like pretty good evidence that it's confusing. When I raised this issue last year with regard to the Statement, the agency's solution was to take the phrase "in today's dollars" out to the Statement. That eliminates one problem, but leaves the reader to only guess in what form their benefits might be expressed. Second, even if there were full disclosure that benefit estimates were in wage-indexed dollars, it's not clear to me whether there's any usefulness in the number. I understand how to calculate wage-indexed dollars, but these figures don't mean anything to me (and I'd guess not to other people either). Moreover, anyone who's actually trying to plan their retirement – which, presumably is what the Statement and the online calculators are for – would express their retirement income either in today's dollars (to show their real purchasing power) or in nominal dollars, to make them comparable to benefit estimates from 401(k) plans or DB pension plans. (If anyone can find me a retirement calculator that expresses income in wage-indexed dollars I'll send you a bottle of wine to celebrate.) Throwing wage-indexed dollars into the mix serves only to confuse people or give them mistaken estimates of their retirement income. As you might have noticed, this is an issue that ticks me off. There's very little substantive case for showing benefits in wage-indexed dollars – try to explain to someone what they mean and you'll see the blank look on their face. That's probably why there's no effort to explain any of this either on the web sites or in the Statement. While it would be a simple task to fix the calculator and Statement so they would show benefits in inflation adjusted dollars, I suspect the reason this isn't done is that people would ask questions why their benefit estimates had changed from last year to this year. What most people would see as an improvement some people in the agency would perceive as an admission that they'd previously been wrong, and some folks don't like to do that. But that mis-serves the public: Social Security is the largest form of retirement income for most Americans and the only way the typical person can know what they're going to get is if they're told. We should do a better job of telling them than we are. 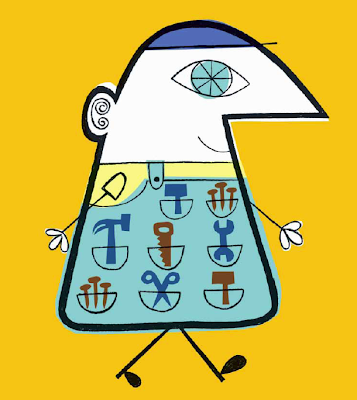 The Center for Retirement Research has updated their very nice Social Security Fix-It Book. Check it out here. This afternoon I appeared with other members of the Fiscal Wake Up Tour – the Concord Coalition's Bob Bixby; the Brookings Institution's Isabel Sawhill; and the Peter G. Peterson Foundation's David Walker – on Southern California Public Radio's Patt Morrison show to talk about the fiscal challenges facing the country. I was a bit downbeat today, maybe because the health reforms that were supposed to fix our budget problems will more than likely make them worse. But some things have to get worse before they can get better; let's hope this is one of them. In any case, tune in online by clicking here. On Friday I was lucky enough to moderate a great session at the annual APPAM conference on Aging, Health and the Challenge of Entitlement Growth, featuring a presentation by CBO director Doug Elmendorf and comments by Gene Steuerle of the Urban Institute and Jim Klumpner, a long-time Capitol Hill economist who now teaches at Princeton and George Washington. While nothing can replace the actual presentations and the discussion that followed, which was of course moderated to perfection, I've posted the PowerPoints by Elmendorf, Steuerle and Klumpner. Thanks to CBO's Joyce Manchester for landing the big fish for the session. Large-scale changes in American family structures over the past decades have important implications for the retirement experiences of women. In this study, the authors use a restricted-use file of the Marital History Module of the U.S. Census Bureau's Survey of Income and Program Participation to investigate changes in the marital histories of women aged 40 to 69 years between 1990 and 2004, with a focus on outcomes relevant for Social Security spouse and widow benefit eligibility. Multinomial and binary logistic regression analyses show significant changes in women's marital patterns since 1990, with more substantial shifts occurring among recent cohorts. Due to downward trends in marriage, the authors find a modest decline in Social Security spouse and widow benefit eligibility in 2004, particularly among Black women born toward the end of the baby boom generation. This made me think of two things: first, about the only way to get a truly good return from Social Security going forward is for one member of a household to receive spousal benefits; but second, changes in marital patterns by race could mean that spousal benefits become predominantly for white people. I prepared the chart below from Census data a few years ago and so the data isn't completely up to date, but the changes in black/white marriage rates since the 1950s are pretty extreme. 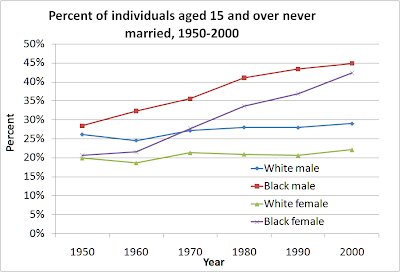 Back in 1950 blacks had roughly the same marriage rate as whites, but since then patterns have sharply diverged. In 2000 around 25 percent of whites over age 15 had never been married, which is only a few percentage points higher than the 1950 level. But around 44 percent of blacks had never been married in 2000, compared to only around 25 percent in 1950. As a result, fewer and fewer black retirees in the future will tend to be eligible for spousal benefits. I'm not a huge fan of Social Security's spouse benefits, which seem to reward neither contributions nor need, and – as I'll point out in Friday's sure-to-be-fantastic AEI panel on Social Security's effect on work incentives – impose high marginal tax rates on women's labor. But these racial disparities might be another reason to give spousal benefits the heave-ho. This paper analyzes new data on financial literacy and financial sophistication from the 2008 Health and Retirement Study. We show that financial literacy is lacking among older individuals and for the first time explore additional questions on financial sophistication which proves even scarcer. For this sample of older respondents over the age of 55, we find that people lack even a rudimentary understanding of stock and bond prices, risk diversification, portfolio choice, and investment fees. In view of the fact that individuals are increasingly required to take on responsibility for their own retirement security, this lack of knowledge has serious implications. On Friday November 13 at AEI we'll be holding a panel discussion titled "Keeping Granny on the Job" looking at the ways in which Social Security and Social Security reform can affect incentives for individuals to delay retirement. The second paper will be presented by Estelle James, a pension consultant and lead author of the World Bank's "Averting the Old Age Crisis." The paper, co-authored with Alejandra Cox Edwards of California State University, Long Beach, is titled "Do Individual Accounts Postpone Retirement: Evidence from Chile." It looks at the labor force participation of individuals under Chile's reformed pension plan, which is generally actuarially neutral with regard to additional work, relative to individuals who remained under the previous defined benefit program. Jagadeesh Gokhale, senior fellow at the Cato Institute, will provide commentary. It should be an interesting event. The panel is from 12 to 2 pm; lunch will be provided. Click here to register. TaxProf Blog links to comments by Benjamin Templin on an earlier Cornell Law Review article by Neil Buchanan. Buchanan argues that we shouldn't take projections of Social Security's insolvency all too seriously; Templin replies that it makes sense to diversify the Social Security trust fund into stocks, even if we aren't yet sure if/when insolvency will take place. I commented on some of Buchanan's arguments here. While I enjoyed both articles, it does strike me that there's a qualitative difference between law review articles on Social Security and those in policy or economic journals. There's more footnoting in law review articles, to be sure – I was shocked at how much extra citation work was requested when an article of mine was adapted for a law journal – but overall the presentation of evidence and argument strikes me as generally sloppier than what you'd find in a policy article. Maybe it's because lawyers see themselves as proponents of arguments with less obligation to present contrary evidence – I guess the opposition is supposed to supply that. For instance, Buchanan notes "the overwhelmingly regressive effect of the Bush tax cuts." Being curious, I checked the cite: it simply references the 2001 and 2003 tax legislation, as if that's enough to establish overwhelming regressivity. Overall it just doesn't seem at the level you'd expect from a good economics or policy article, be the author from the left or the right. The University of Michigan's Retirement Research Center has released its fall newsletter. Here are links to the main stories – check 'em out, wonks (and others). The University of Michigan Retirement Research Center is pleased to announce its research awards for 2009-2010..
Why is there so much waste in health care? My short answer: too many incentives point in that direction. My longer answer is over at the Washington Examiner. Since Social Security recipients will get no cost-of-living adjustment (COLA) next year, President Obama wants to give each of them $250, a move supported in principle by the Republican House and Senate leadership. However, this move is not only unjustified; it makes a fundamental change to Social Security's structure and starts the process of converting the program from an earned benefit funded by a worker's own contributions to a welfare program. While there will be no Social Security COLA, benefits will not decrease, despite the fact that the cost of living has gone down, thus increasing the amount that recipients can buy with their existing benefits. And the benefit would mean even larger spending in a year with record deficits. This new $250 payment would follow the earlier $250 payment that each Social Security recipient was paid through the stimulus package this year. Check out the whole paper here. On Monday, October 26th, 2009 the Savings and Retirement Forum will be held at The Brookings Institute: 1775 Massachusetts Ave, NW, Washington, DC 20036, at 8:30am. Mark J. Warshawsky, Ph.D., Director of Retirement Research Watson Wyatt Worldwide will be discussing "TDF Assett Allocations Risk vs Reward Tradeoffs"
If you plan on coming please RSVP. Coffee, juice, and pastries will be served. Security will be the next big issue in the political forefront. Be ready for the debate. This event will bring you up to speed with policy options from NASI's new report addressing adequacy and solvency of the U.S. Social Security system as well as poll findings on Americans' views on Social Security from the Benenson Strategy Group. Copies of the reports will be available at the event. For more information and to register, please visit the event page on our website. Concerned About America's Fiscal Future? The Fiscal Wake-Up Tour is rolling into Denver tomorrow, October 22, and you are welcome to watch as national experts discuss how the country can plan for a better economic future in the face of skyrocketing federal debt, an aging population and rapidly rising health care costs. The Wake-Up Tour, which is making its second stop in Denver, has been profiled in "60 Minutes" and the highly acclaimed documentary I.O.U.S.A.. David Walker, President and CEO of the Peter G. Peterson Foundation and the former U.S. Comptroller General, and Robert Bixby, executive director of the Concord Coalition are set to speak — view other speakers and the agenda here. To join the live webcast tomorrow, visit http://www.concordcoalition.org. Also featured in the live webcast is "Paying for America," a student summit presented by the University of Denver and The Concord Coalition as part of Concord's Fiscal Stewardship Project. The summit will give college students an opportunity to learn more about our nation's fiscal and economic difficulties. There will be panel discussions on the causes of these problems, how they could affect the students for the rest of their lives, and potential solutions. This seems to be a good time to discuss it more, since SSA's Chief Actuary Steve Goss has circulated a memo on the Hill (available here) discussing the notch issue. (Steve's been very helpful to me in understanding a really tricky issue.) Since the memo is short I'll paste in the text and then give a quick response. Andrew Biggs recently noted (Forbes Commentary, October 9, 2009) that retired workers who were born in 1947, and will reach age 62 in 2009, did not receive the 5.8 percent cost of living adjustment (COLA) awarded to Social Security beneficiaries eligible in December 2008. This is true. However, the workers born in 1947 did receive a 4.54 percent increase in their benefits through the wage-indexed benefit formula. And this increase will not be applied for retirees born before 1947. Therefore, the difference of about 1.2 percent is the amount by which benefits will be lower for life for a worker 62 in 2009, compared to a similar worker reaching 62 in 2008. Is this a "notch", and is it unusual? Unfortunately, consumer prices and the average wage level do not rise smoothly over time. The increase in the CPI that caused the 5.8-percent COLA for December 2008 just happened to be bigger than the 4.54-percent increase in the average wage that retired workers age 62 in 2009 will receive instead of the COLA. So yes, this is a small "notch". Is this unusual? Actually, the COLA received by existing beneficiaries has been larger than the average wage increase applied for newly-eligible beneficiaries in 9 of the 30 prior years. And in 5 of these years the difference was greater than it is for 2009. So the 1.2-percent difference between benefits for those age 62 in 2008 and those age 62 in 2009 is neither very large nor very unusual. The first thing to remember is that I didn't argue that a notch existed because individuals in the 1947 cohort would receive lower dollar benefits than individuals in the 1946 cohort (although they may). I argued that unusual changes in prices over the course of 2008, interacting with the benefit formula, mean that individuals aged 61 in 2008 will receive lower benefits than they otherwise would have. However, comparing two cohorts may nevertheless be useful so long as we bear in mind how Social Security intends benefits to change between cohorts. Social Security is a wage-indexed program, meaning that initial benefits rise from cohort-to-cohort along with average wages. This maintains a roughly constant replacement rate – the ratio of initial benefits to average pre-retirement earnings. (Social Security calculates pre-retirement earnings as the wage-indexed average of the highest 35 earning years.) As a result, we'd expect the 1947 cohort to receive higher benefits than the 1946 cohort, assuming they had higher average lifetime earnings. The fact that benefits are lower is notable. Typically the replacement rate for a medium wage earner is around 40 percent; since the retirement age isn't currently increasing, let's assume the replacement rate would ordinarily be 40 percent for both the 1946 and 1947 birth cohorts. To make things simpler still, let's think of the numerator and the denominator of the replacement rate separately; in other words, imagine as if a person received a benefit of $40 (say, per day) and had pre-retirement earnings of $100 (again, per day). OACT's memo points out that a typical person in the 1947 birth cohort received benefits 1.2 percent lower than a similar person in the 1946 birth cohort. So, using our simplified formula, that $40 daily benefit falls to $39.52. The memo also notes average wage growth of 4.54 percent in 2007, the year the 1947 birth cohort turned 60. This, in turn, increases the wage-indexed average of lifetime earnings by around 4.54 percent, since the Social Security benefit formula indexes past earnings to wage growth through age 60. So that $100 daily pre-retirement earnings for the 1946 birth cohort increases to around $104.54 for the 1947 cohort. Divide it out and you get a replacement rate of 37.8 percent. Now calculate the percentage differences in replacement rates: 1 – 37.8%/40% = 5.5%. In dollar terms, benefits for the 1947 cohort are around 5.5 percent lower than needed to maintain the same replacement rate received by the 1946 cohort. This was the point I attempted to make in the Forbes article. Now, there are many possible "notches" that can be created by the benefit formula and there are other things going on that might reduce the cut for the 1947 cohort a little. I'll get into them as I write on this more. Would the Baucus health plan “raid” Social Security? I say yes, over at National Review Online. The health legislation sponsored by Senate Finance Committee chairman Max Baucus (D., Mont.) received an apparent boost when the Congressional Budget Office stated it would reduce the budget deficit by $81 billion over the next ten years. Obama administration budget director Peter Orszag crowed that the CBO scoring "demonstrates that we can expand coverage and improve quality while being fiscally responsible." But the CBO analysis actually leads to a very different conclusion: that in a classic "raid" on Social Security, Baucus's ostensible fiscal responsibility depends on raising Social Security taxes today to paper over new health spending, ignoring that those increased Social Security taxes imply higher benefit costs down the road. This marks yet another gimmick in a health-reform debate defined by contrivances. Orszag recently outlined the Obama administration's standards for health-care financing, saying that "health care reform must be deficit neutral over the next decade (as well as being deficit neutral in the tenth year alone)." Balancing revenues and costs over the next ten years purportedly addresses short-term deficit concerns, while balancing in the tenth year signals that a plan won't generate longer-term shortfalls. President Obama says he will not sign legislation that fails these tests. Unlike other congressional proposals, the Baucus legislation appears to meet Obama's criteria. Baucus's plan purportedly would improve the budget balance by $81 billion from 2010 through 2019, and in 2019 itself would cut the deficit by $12 billion. It's no surprise the media treats Baucus's plan as if it belongs to Obama himself. But the devil is in the details of the CBO memo. CBO breaks down the Baucus plan's budgetary effects into those occurring "on budget" (where the substantive policy changes are) and those "off budget" (meaning through the Social Security program). The Baucus plan's on-budget provisions would reduce the ten-year budget deficit by a tiny $1 billion and in 2019 would increase borrowing by $6 billion. In the real world, where entitlement costs rise faster than projected and Congress fails to implement promised cuts to Medicare spending, the Baucus plan will doubtless generate significant deficits. Meanwhile, the Baucus plan's fiscal skullduggery takes place off-budget. Social Security revenues would increase by $80 billion over ten years, with an $18 billon increase in 2019 alone. Around 3 million individuals would leave employer-sponsored health coverage — which is exempt from taxes — to purchase insurance through a subsidized "exchange." Leaving employer-sponsored coverage would raise workers' taxable wages and thereby boost Social Security revenues. Millions more would trade a portion of their insurance benefits for higher wages to avoid a new tax on high-cost policies. By skimming the new Social Security taxes, the Baucus plan appears to significantly cut the deficit when, in truth, it balances only by the skin of its teeth. This is perhaps the clearest example of "raiding the trust fund" on record. Democrats and Republicans have long believed that Social Security surpluses encourage the rest of the budget to run larger deficits, as borrowing from Social Security does not increase the measured budget deficit or the publicly-held national debt. But it's difficult to tell whether any particular legislation comprises a "raid," since the legislation might be passed even in the absence of Social Security surpluses. In the case of the Baucus proposal, however, it is incontrovertible. The plan does not simply rely on existing Social Security surpluses but creates new ones to offset higher spending on health coverage. Without new Social Security revenues the plan would not balance and, if the president is to be believed, would face a presidential veto. It's that simple: no new Social Security taxes, no new spending. A health debate that began with earnest claims that we could "bend the cost curve" to cut costs while increasing quality has devolved to a farce in which vastly increased government spending is papered over with implausible spending cuts and dubious bookkeeping. — Andrew G. Biggs is a resident scholar at the American Enterprise Institute and former principal deputy commissioner of the Social Security Administration.